The weather here has been just beautiful, especially when you compare it to almost everywhere else in the US. If you are a beach goer looking for swimming in the surf it has been pretty cool for that but if you are a fisherman it has been super, pretty much perfect weather. Early morning lows at around 50 with little wind and fewer clouds. 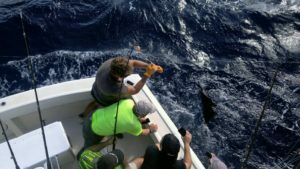 Bright blue skies and great sea conditions for Deep Sea fishing in Fort Lauderdale. 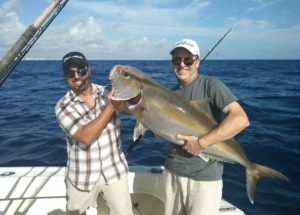 If we could change anything it would be for a bit more current to get more fish on the move, but we have caught Kings, Sails, Mahi and fat Amberjacks the last 3 days. Once again no big numbers. A bit more current would have helped the bottom line as it has been erratic, but it has been fun being out there in the present conditions, and mixing it up hunting fish. 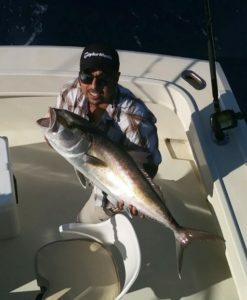 Some Kingfish on the reefs but it involves searching them out as they are widely scattered and we are drawing only single bites from them. Make a circle without another bite and move on has been typical. Slightly off the edge in about 120 feet of water seems to be a good depth to concentrate your efforts. The better news is that the bites we do get are strong and we are hooking most of them. 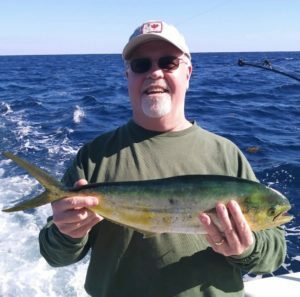 We have caught some Mahi-Mahi in 250 to 350 feet and we did see some out in 900 feet of water along with a Wahoo when we wandered deep one day due to skimpy catches inside. Beautiful edge there that day but only a few fish due to the time of year and that simply because we see far more fish near shore as a rule this time of year. Mid summer and that edge would likely have been alive with fish. Just a beautiful edge, so pretty we set our favorite Marlin plug out on the left corner on 80# along with two larger teasers, but no takers. Few Sailfish yet despite the latest 2 frontal systems. Nice fish in the picture taken at boat side. Saw three fish tailing yesterday afternoon out in 350 feet but they had zero interest in the live baits we threw at them. Nice swell there with the slight northerly current had them up on top but they were very antsy. 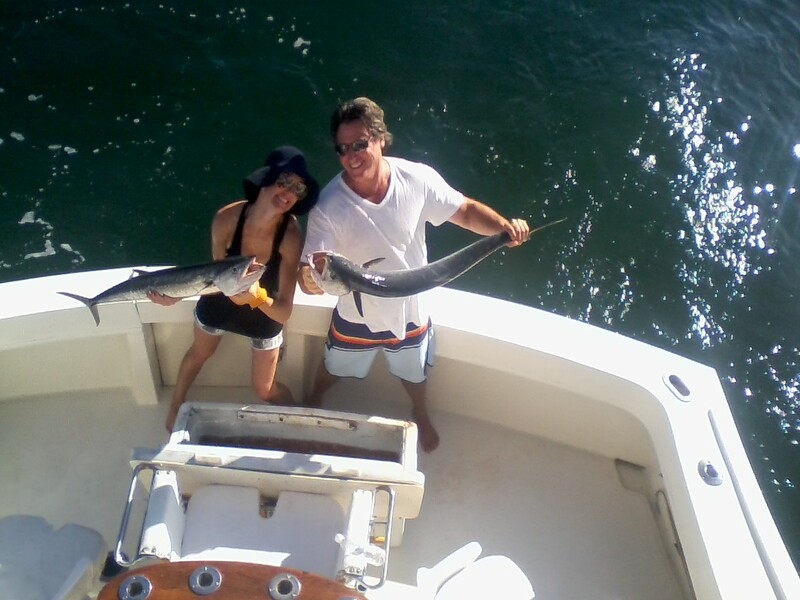 Tight lines, get out there and enjoy this wicked nice fishing weather from all of us here aboard the Marlin My Darlin.